How to review Which? Trusted Traders - Which? If you’ve used or attempted to use one of our Trusted Traders, we want to hear your views about their work. Sharing your experience about a trader can make a difference to other customers who are looking for someone to work on their home. Feedback also helps the traders to learn more about which areas of their business are working, or where they could improve. We pride ourselves on moderating 100% of our reviews to make sure they comply with our terms and conditions. This can involve checking IP addresses, speaking to the reviewer on the phone and requesting documents relating to the work such as proof of purchase. While no system is fail proof, we will always seek to reject and hide reviews if we don’t believe they are authentic. Search our database to find a trader near you who has passed our assessments and earned the Which? Trusted Traders endorsement, and see what other customers have said about their work. The first step is to find the trader’s profile on our website. You can either search for the business on our homepage, or use the blue ‘Leave a review’ button found in the top right of most of our webpages or within 'Menu' on mobile and tablet. This will also open the search bar or show you the traders you’ve looked at recently. 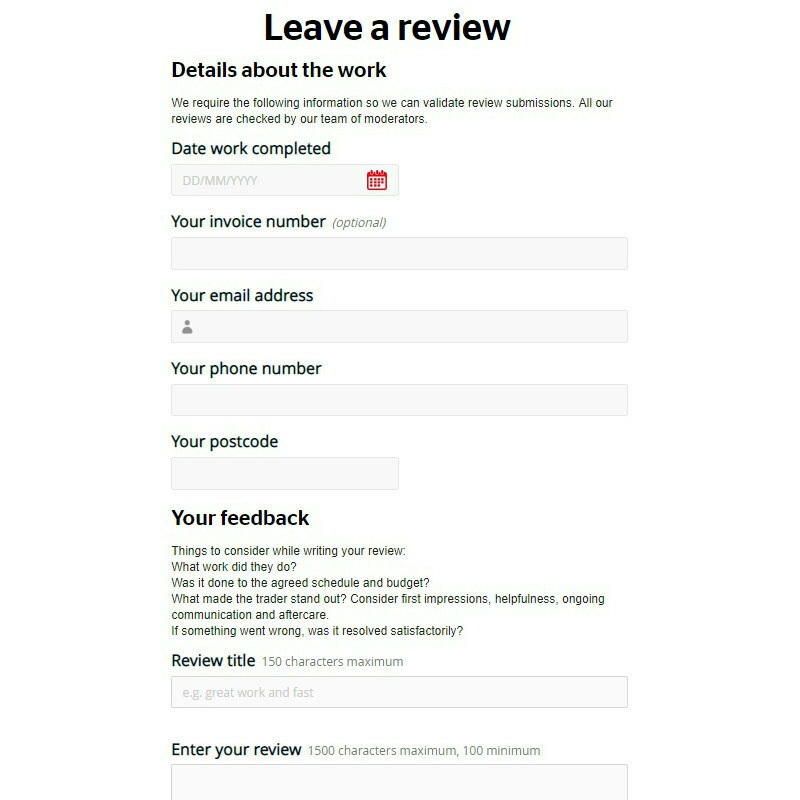 Once you’ve found the trader’s profile, use the ‘Create a review’ link to open the review form, as shown below. You can then enter your comments about the trader and rate their services. quality of work – how well was the job done? costs – was the quote you were given accurate? professionalism – did the trader take pride in their work? communication – was the trader easy to contact and did they respond quickly? clarity – did they clearly explain the work to you? flexibility – how did the trader respond to requests for alterations? punctuality – did the trader turn up on time? cleanliness – did the trader respect your property and tidy up after themselves? problems – were there any problems with the work and, if so, how did the trader deal with them? would you recommend the trader to another customer?